Male: Chestnut brown upperparts, speckled breast, grey head and tail. Female: Like the male, but more streaked and very little grey. 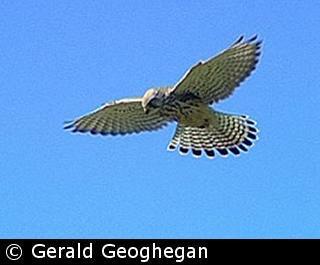 The Kestrel is a small, chestnut brown bird of prey that is frequently seen hovering over grassland. The hooked bill is a bluish colour with yellow cere. The legs are yellow. 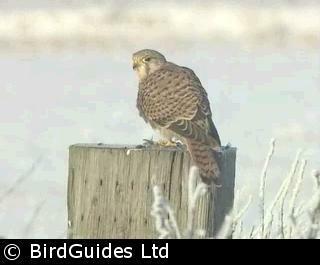 The male (or tercel) Kestrel has black-spotted chestnut brown upperparts, and a blue-grey head and tail. The tail has a single black bar at the tip. Underneath, the breast and belly are buff coloured with black spots. The female (or falcon) is darker than the male and the back, mantle and wings all have black barring. The tail has black barring along its length. The creamy underparts are more heavily streaked in black than the male. Occasionally, the head and tail may be tinged with grey. The call is a loud shrill "kee-kee-kee", which can sometimes be confused with Nuthatch calls. Kestrels feed on small mammals, such as voles, shrews and mice, birds as large as Starlings, and invertebrates, such as beetles, grasshoppers and worms. In gardens, they will take meat scraps. In addition to having exceptionally good eyesight, Kestrels can also see ultra-violet light. This used to be thought to help them locate voles because they leave a trail of urine wherever they go and the urine glows in ultra-violet light but this is no longer believed to tbe the case. They nest in a hole in a tree or on a ledge on cliffs or buildings, and simply line the hole or ledge with sticks and straw. The eggs are about 39 mm by 32 mm, smooth and non-glossy, white or yellowish-buff with red-brown markings. Incubation is by the female only. Both adults feed the young birds, though the newly-hatched are usually fed by the female with the male hunting and bringing the food to the nest. Kestrels are resident though altitudinal migration takes place in northern upland populations - moving south from upland breeding grounds to lowlands for the winter. The east coast of Britain also attracts many Continental birds in the winter. Juveniles disperse from their natal grounds in July–August and may travel up to 100 miles (150 km). Kestrels had suffered from the effects of pesticides, but appeared to have recovered by the mid-1970s. Since then the population has declined up to 30% in farmland areas, especially in western Britain and the population may now be as low as 30 000 pairs. This latest decline may be related to agricultural intensification, i.e. small mammal populations have fallen owing to the loss of their habitat in wide field margins. 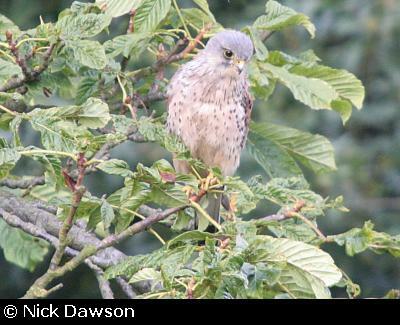 The Kestrel is on the amber list of birds of medium conservation concern.